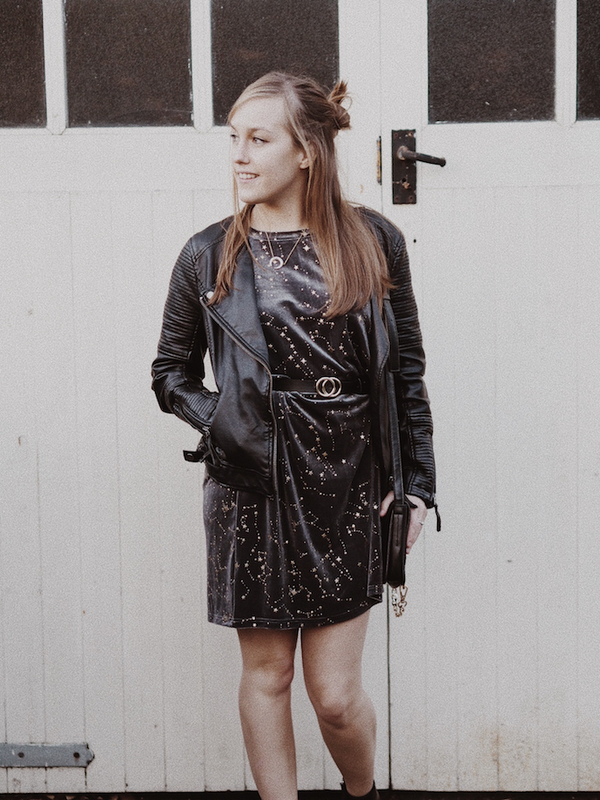 Party season outfit idea number two! Still a dress, but I feel a lot more casual. When I saw this I knew from the moment I laid eyes on it I HAD to have it in my wardrobe for the party season. I am all about stars and constellations at the moment and the gold against the grey/black velvet colour was just too dreamy. Now when I got it in an extra small, put it on and in all honesty it swamped me completely it was HUGE. But I styled it with my trusty belt and pulled it up to make it a little shorty and still loved it. So velvet? check! Star pattern? check! and gold details? check! 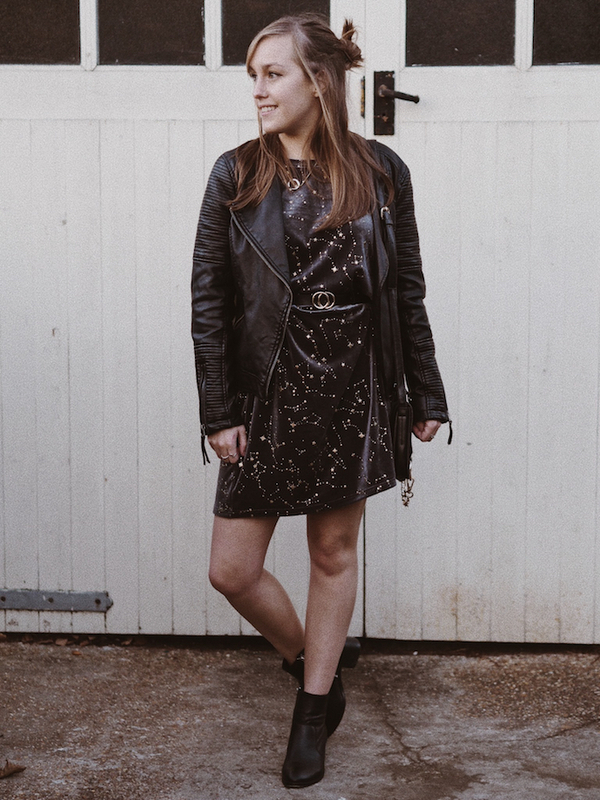 What more could you want in a party season outfit? 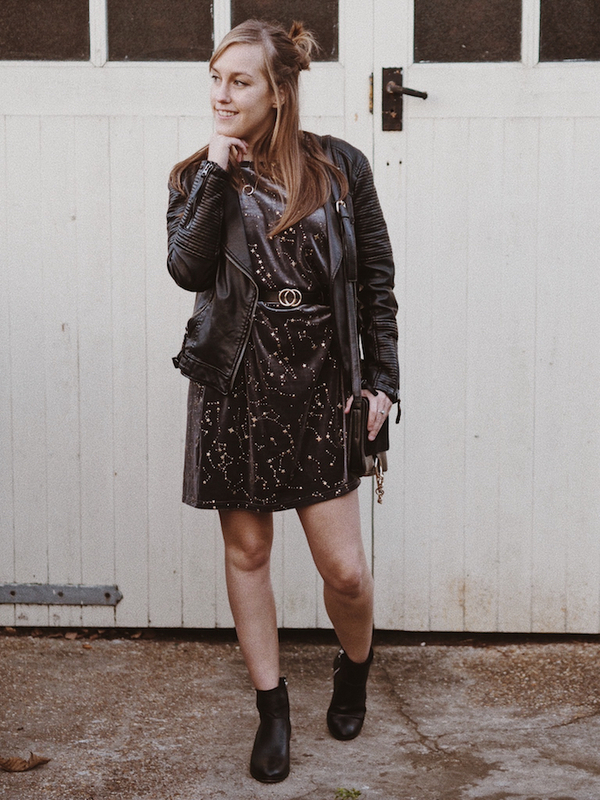 I paired it with my trusty pair of sock boots that I go for my birthday and I think along with my leather jacket it gives it quite a cool vibe, some might even say biker chic! 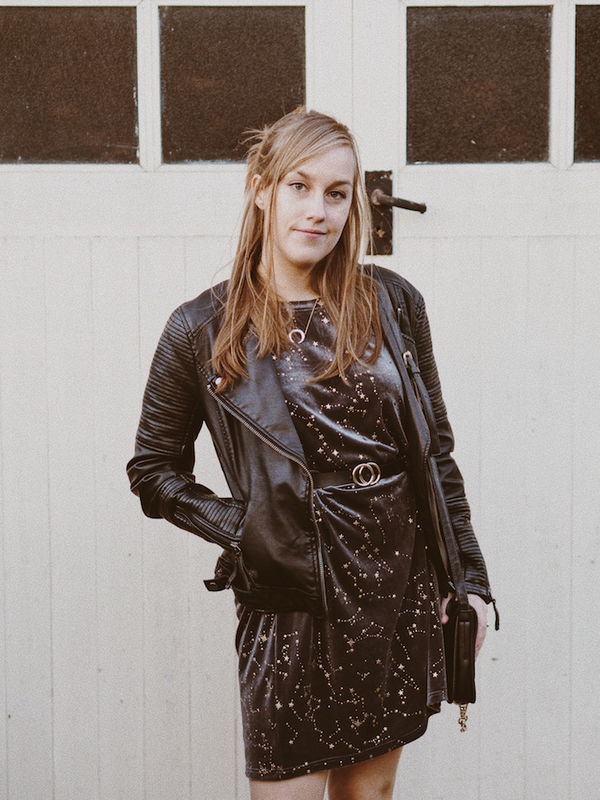 I just feel the two tied the dress so well together and again if I wanted to it would be perfect for a Christmas work do or a house party on new years eve as it's not too dressy but has the perfect little details just to look festive enough! Now I knew because the gorgeous pattern was gold I had to get all of my accessories to match as you know that's what is seen as the done thing and all. Now I was going to wear my ASOS necklace, but then I remembered about my gorgeous Stella and Dot necklace and thought although the pendant is silver, it would look cool because I could pretend it's a moon and also the chain is gold so it's all good! 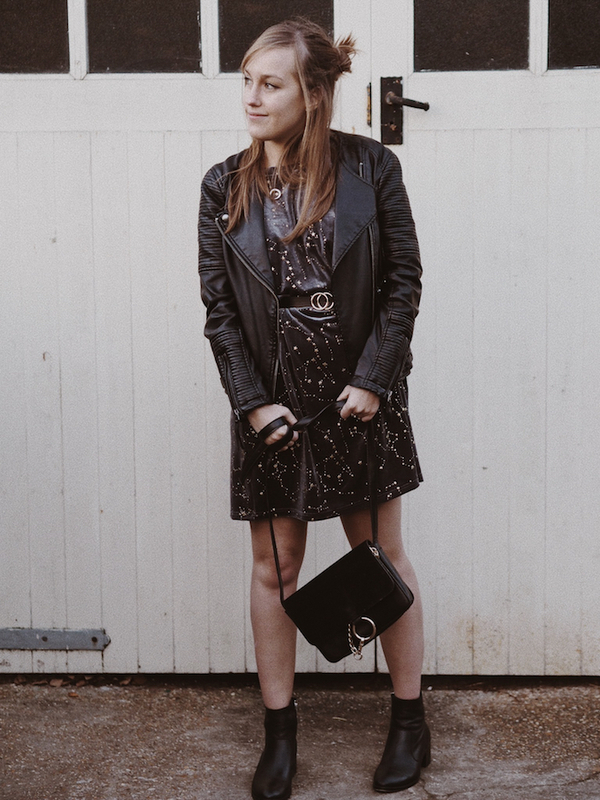 I bought out my Chloe Faye dupe for this outfit as I hadn't worn it in a while and it has the gorgeous gold chain detail, perfect! Who's fully in the festive spirit now?! Only 19 days to go! Have you done all of your Christmas shopping yet? 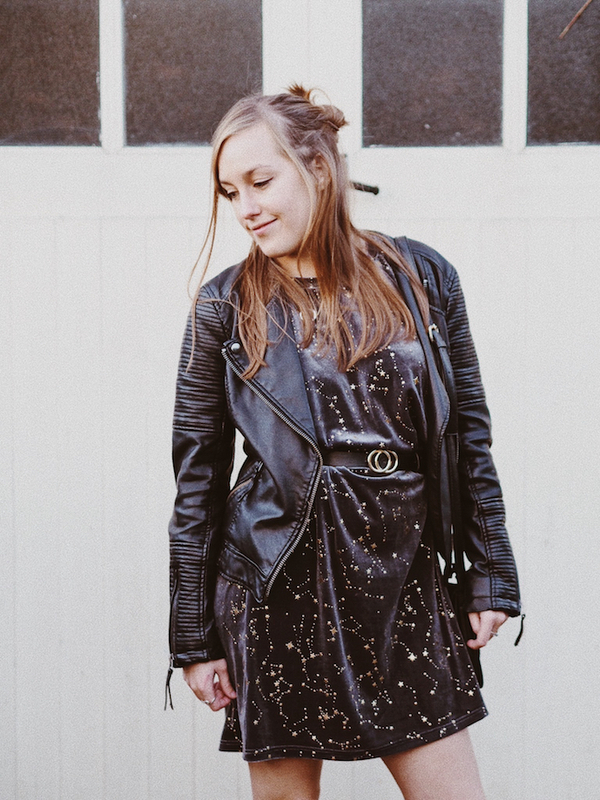 I'm totally obsessed with all things zodiac/astronomy so this dress is right up my street! Such a unique pattern - definitely a great conversation starter!